Notes: Based on the manga of the same name by Akihito Yoshitomi. A bit of a correction here: this title has to date never been released on R1 DVD. 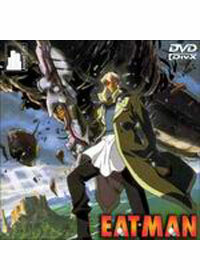 The second series, Eat-Man '98, is available and will be treated in a separate review. Bolt Crank is a very special sort of mercenary. He can consume metal and metamorphose powerful weapons out of his right hand. More importantly, he's an itinerant philosopher. This TV series focuses more on the latter aspect of the nut-chewing "Eat-Man". I love my sister-in-law dearly. But I fail to see the reason she swears by this dull, awkwardly moralizing, and ambiguous series, in which you almost never see the main hero's gimmick. Blink your eyes in an inopportune moment, and you miss all the action sequences. Which, coming from a fairly cool manga, is an incredible disappointment. The manga itself, though, was prone to being episodic and disjointed, and the TV series follows that to the letter. There is almost no follow-through between episodes, which precludes there been much of an overlying plot until some point in the series later than we've seen. Unfortunately, the episodes we have seen share a few common bonds. Namely that they're boring, badly paced, and completely underutilize the title character. One could argue that the pacing was to bring out a sense of style in the main character. However, when all the main character does is lie down, mutter some tripe about the world being round, and then ambiguously resolve the episode ... well, needless to say, we were looking forward to the next anime once this tape had run its course. Not helping matters at all are the simply horrendous music tracks ("Melody! Melody! Melody! Gone straight to Hell!") and the dark, still-frame prone, and badly-detailed animation. Again, had it been better paced and edited (and had actually done a job of resolving loose threads), then we'd have a palatable anime, but instead, we get tripe like "I'm not a hitman because life is like a box of chocolates," or some other maundering palaver. It was certainly enough to have the audience start yelling at the characters to do something other than just sit there and angst. Personally, we have better things to do, and better anime to watch. Too bad, because this series should have been so much better. Recommended Audience: Some offscreen deaths, and a bit of violence. I'd personally be more worried about the sedative properties of this title, though. Older children and above should be okay, so long as they stay awake.